fact card here about social hosting in Winneshiek County. If you are interested in the safety of teens in your community, we encourage you to participate in a local coalition. Nearly each county we serve in has an independent county-run volunteer coalition. Our staff serve as members of these groups, and help organize and implement local initiatives to prevent substance abuse. Contact prevention@helpingservices.org to learn more! Give people what they want and protect them from overdoing it. Anyone who sells or serves alcohol furnishes a desired service, and they also create the environment for low-risk drinking to take place. So, how can we help sellers and servers succeed? We can make sure businesses have access and encouragement to attend a Responsible Beverage Server (RBS) Training, because their success affects us all. Along with learning tips for properly checking IDs, trainees build service skills and confidence in a way that profits the company while protecting customers. It is impossible to look at someone and know their blood alcohol level, so servers are taught to look for behavioral cues. Signs—losing inhibitions, impaired judgment, slowed reactions, and loss of coordination—tell servers when guests are becoming intoxicated. Servers then learn different ways to “cut off” or offer alternatives to those patrons. Finally, they learn the importance of prevention through seeing the repercussions of scenarios, such as selling to a minor or over-serving a patron who gets behind the wheel. 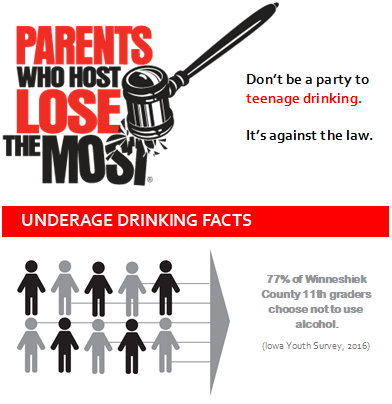 Underage and excessive drinking costs the United States billions of dollars each year for loss in productivity, crime, health care, and other expenses, not to mention the lives this behavior harms or tragically takes. Responsible Beverage Server trainings empower retailers and their employees to positively influence guests’ drinking behavior. If you serve or sell alcohol, or know someone who does, come to a free training or request to host one. Collectively reducing underage drinking and binge drinking will make our communities a healthier place for everyone to live. Contact Jen, at jkimber@helpingservices.org, for training schedule or to request to host one. Mercy Medical Center is committed to the overall health and wellbeing of our community. As part of our ongoing efforts to combat the heroin epidemic, Mercy Medical Center and Mercy Family Pharmacy today announced that they will begin distributing overdose rescue kits containing naloxone (Narcan®), the drug that can prevent heroin or opioid overdoses from being fatal. A new state law, signed by the governor in April, expanded naloxone access to first responders and family members of those suffering from opioid addiction. The Iowa law requires a prescription for the purchase of naloxone. Waivered physicians Dr. Thomas Boxleiter, Dr. Umesh Chakunta, and Dr. Adib Kassas, of Medical Associates Clinic, are writing naloxone prescriptions for patients engaged in medication assisted treatment services. Additionally, Dr. Boxleiter is executing a collaborative agreement with Mercy Family Pharmacy pharmacists to make naloxone overdose kits available to all those who need it in the community. For individuals who are enrolled in medication-assisted treatment services (suboxone therapy) though Mercy Turning Point Treatment Center or Substance Abuse Services Center (SASC), kits will be funded through a federal Substance Abuse and Mental Health Services (SAMHSA) grant awarded to Mercy Medical Center to combat the heroin and opioid epidemic. For information about enrolling in medication-assisted treatment, call Mercy Turning Point Treatment Center at 563-589-8290 or Substance Abuse Services Center at 563-582-3784. Iowa residents can obtain a naloxone rescue kit by attending a required, 30-minute training session at Mercy Medical Center – Dubuque. The training includes information on when and how to administer naloxone, how to perform rescue breathing, and time to ask questions. Upon completion of the training, attendees can present their certificate of completion at Mercy Family Pharmacy located at Mercy Medical Center, 250 Mercy Drive, to receive the two-dose naloxone rescue kit. Friday, August 5 at 12 p.m.
Monday, August 15 at 6 p.m.
Monday, August 29 at 12 p.m. Subsequent dates will be added. Classes are free, but registration is required at www.mercydubuque.com/events or 563-589-9600. Access to the naloxone rescue kits in Dubuque is the result of a community-wide response to a spike in heroin-related deaths in the area. A group of medical professionals, community leaders, and social service agencies have been meeting regularly since April to work on solutions to the heroin epidemic. The group includes representatives from Mercy Medical Center, Mercy Family Pharmacy, Medical Associates Clinic, Dubuque Mercy Health Foundation, Crescent Community Health Center, Substance Abuse Services Center (SASC), Helping Services for Northeast Iowa, the City of Dubuque, and State Representative Chuck Isenhart. It’s a hard truth: our youth are using alcohol, tobacco, and other drugs. But talking with youth about these deadly temptations can help them choose to be substance-free. Yes, those talks can be challenging, but we need to let youth know we care! Youth Mentoring at Helping Services is providing a free training to prepare you for those important conversations. Join them on May 24, from 6:30 to 8:00 p.m., at First Lutheran Church in their Fireside Room at 804 W. Broadway Street, Decorah. The training’s presenters are experts in the field of youth and substance abuse prevention: Colinne McCann, Iowa Department of Public Health AmeriCorps member; Jen Kimber, Community Prevention Specialist, Helping Services; and Captain Scott Herrmann, Decorah Police Department. Where to get facts and information to which that youth will relate. With this knowledge you can influence youth to chose to not use alcohol, tobacco, and other drugs. Light refreshments will be provided. Please RSVP to Colinne at 563-387-1720 or cmccann@helpingservices.org. Mentors in Youth Mentoring at Helping Services spend 4-5 hours per month with their youth doing activities such as working on a car, fishing, hiking, bike riding, or going to a movie. Matches are made based on the similar interests of the youth and the adult friend. Youth in the program do not have to meet any special criteria other than to live in or attend school in the counties Youth Mentoring serves: Allamakee, Delaware, Howard, and Winneshiek. To become involved in this exciting opportunity, contact Kathy Schwartzhoff or Colinne McCann at 563-387-1720. For over 40 years, Helping Services for Northeast Iowa has been promoting the health and well-being of children and adults. We work to end domestic violence and child abuse; build healthy families, friendships, and relationships; and educate and empower people to stop the future misuse and illegal use of alcohol, tobacco, and other drugs. Staff provide presentations, research-based programs, trainings, and advocacy to work with community members in creating safe, nurturing, and healthy environments.